Be the first to share your favorite memory, photo or story of Arramenta. This memorial page is dedicated for family, friends and future generations to celebrate the life of their loved one. 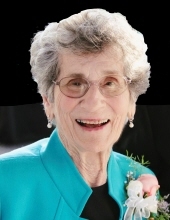 Clemson- Arramenta Murph Hite, 96, widow of the late Henry Bluitt Hite, passed away, March 20, 2019, at Clemson Downs. Born in Calhoun County, Arramenta was the daughter of the late Marvin Livingston Murph and Arramenta Smoak Murph. Arramenta was a devoted wife, loving mother, grandmother and great-grandmother and a gifted educator. She was an active, life-long member of Saint Mark United Methodist Church serving in various roles and could often be seen carrying roses or vegetables from the family garden to neighbors and friends. Her special homemade bread, ham biscuits and vegetable soup graced many homes during times of need. Education was a high priority for Arramenta - for herself as well as for everyone around her. Arramenta graduated in 1943 from Lander College. She taught Home Economics prior to marrying H.B. Hite in 1947; then stayed home to raise five children and support her husband with his small business. As her children began to enter college, Arramenta also returned to school and earned her Master’s in Education from Clemson University in 1971. She then taught at J. N. Kellett Elementary School until 1985. Arramenta will be remembered for her gracious hospitality, her spunky personality and her persevering spirit. Survivors include her son, Bob Hite (Jane) of Asheville; daughters, Linda Wilson (Bill) of Anderson, Joyce Carney (Basil) of Seneca, Carolyn Harris (Robert) of Seneca, and Claire Andrews (Chris) of Christiansburg, VA; ten grandchildren and ten great-grandchildren. In addition to her parents and husband, she is preceded in death by brothers, Wesley, Marvin and Julian Murph. A funeral service will be held 3:00 pm, Friday, March 22, 2019 at Saint Mark United Methodist Church with burial to follow at Oconee Memorial Gardens. The family will receive friends from 2:00 to 3:00 prior to the service at the church. To send flowers or a remembrance gift to the family of Arramenta Murph Hite, please visit our Tribute Store. "Email Address" would like to share the life celebration of Arramenta Murph Hite. Click on the "link" to go to share a favorite memory or leave a condolence message for the family.